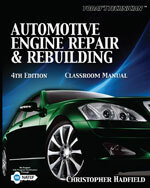 Offers valuable content on the maintenance, diagnosis, and repair of engine systems and components that is practical and relevant to the future professional technician. A thoroughly updated art program showcases current engines, components, and tools that reflect the latest engine advancements in the industry. Practical information on hybrid vehicles includes service precautions and procedures that stress on-the-job care. ASE practice exam in the Shop Manual acquaints the reader with the types of questions they will see on the certification test for Engine Repair.